Students are listening and learning about the experiences, knowledge, and life stories of the human book that they borrowed. From now on, you will be able to borrow and read about diverse people such as sexual minorities, gangsters, drug addicts, ex-convicts, and activists through human booThese days, some people began using a new word, “Human Book.” It is not only people in far-off places who are using this word; the term and the concept behind it have reached Dongguk Universiry, the students, the professors. The Central Library have started using the word from October 15th thanks to a new program. The new program, “Mentoring Living Library,” will begin this month. Many Donggukians will also come to know this word. What do the words, “Human Book” and “Human Library,” mean? There is a great purpose in human books. Through reading human books, readers can meet diverse people and break down certain prejudice and stereotypes. For instance, it could be prejudice or stereotypes of sexual minorities, politicians, vegetarians, female fire fighters, immigrant workers and so on. Also, human books offer a mutual explanation and feedback to readers so that readers can understand and resolve doubts. Moreover, it is not only readers that get help or benefits, but the whole community as well. That is, the human book, itself has its meaning in society. First, one person’s experience, life story, and specialized knowledge become new resource, where it is usually labor that is considered as a resource. Second, because it is peoples’ stories and knowledge that become a source of information, this service program can be evolved into a new type of business, a “specialized experience rental service” suitable for old retirees. After retirement, they can maintain their participation in social activities. Finally, people can share their story not in virtual space of a social network, but in the real space of the human library. Both social networks and human libraries allow people to meet and talk with new people. However, contrary to social networks, people can build relations and have meaningful conversations through reading human book. Human book originated from Copenhagen, Denmark, formed by youth organization called “Stop the Violence.” This non-governmental youth movement was initially made by five youngsters, Dany Abergel, Asma Mouna, Christoffer Erichsen, Thomas Bertelsen, and Ronni Abergel. They established this organization to eradicate both physical and mental violence by offering education or counseling to awaken Danish youngsters against violence. In 2000, “Stop the Violence” was encouraged to organize activities for the Roskilde Festival by the festival director, Leif Skov. The organization arranged events that would put focus on anti-violence, encouraging tlaks between people and give the opportunity to build relations among the festival visitors. This is how human library was born, as a challenge to the open discussion that breaks the prejudice and bias for the people who joined the Northern Europe’s biggest summer festival. A few years later, the organization had 30,000 members all over the country and since then, human libraries spreaded to 70 countries around the world, including Australia, America, Canada, Russia, Hong Kong, and Japan. In human book event at the Santa Monica Public Library in America, readers can check out human books online and hear about the life experiences of them face to face, instead of reading stories. Human books that were loaned from the library had provoking titles such as the ex-gang member, the Quaker, Buddhist, gay parent, celebrity publicist, ex-homeless and raw foodist. Likewise, it increased understanding between people and challenges their prejudice and stereotype by bringing people together who may not usually get a chance to have a conversation. In other way, human book is an opportunity to learn about unfamiliar and usually very challenging life experiences. Korea also has started to run a human library from 2010. The first one started as the National Assembly Library. There were many other public libraries that ran human libraries, but they were all one-off events. However, unlike the other libraries, Nowon Digital Public Library (NDPL) is running a permanent human library. NDPL opened Nowon Human Library in March 21st, 2012 and held its fifth event last month on October 19th. 500 readers and 65 human books came in that event. If anyone wants to read human book, the person needs to join the NDPL webpage and click on the Nowon Human Library link. Then the person can see human book lists and choose one. After choosing, submition of an application is the final step. People can read human book one-on-one, or three readers can meet one at once. In the NDPL, there are ten tables, so about 50 people can read human books. There are 420 human books in the NDPL. Besides NDPL, there are some other libraries that have opened human libraries for one-off events. In October 2012, movie director Lee Joon-ik, art history scholar No Seong-du, and other public figures became human books at the Lee Jin -ah Memorial Library and were loaned to appliers. People had 40 minutes to hear about these well-known people’s life experiences and working lives. 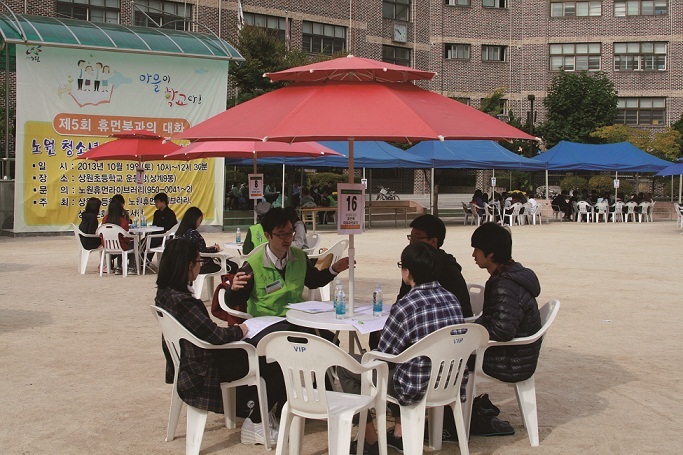 Also, Incheon Metropolitan Namgu Public Library (IMNPL) held the “2013 Human Library” for two days, on July 6th and 7th. The human books were psychologist Lee Nam-seok, book columnist Lee Dong-hwan, pedestrian traveler Sin Jeong-il and so on. The library is planning to open human library twice every year. 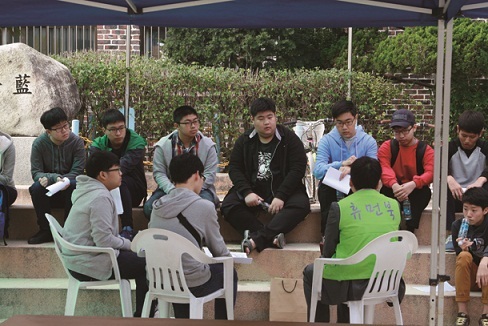 In the case of Korean universities, human book was initially introduced by Korea University’s club KUSPA (Korea University Supporting and Planning Agency) where the students’ organization has been arranging various events for university students since 2008. The organization proposed to bring the “human book library” format from Denmark and implemented it in 2011. They provide an opportunity for university students to experience valuable activities on campus by offering a diverse selection of living books. Available human books include the following: Sexual minority groups, North Koreans defectors, and a feminist and single mother. The culture of human books has been formed from the stories of many people’s lives from all over the world. This cultural movement has the potential to bring positive changes in relationships between people, through discussing real world experiences, and having deeper conversations. Many countries including Korea are now accepting and applying the concept of Human Book with those objectives in mind. Also, several universities in Korea are paying increasing attention to concept of the Human Book. Dongguk University is making steady progress of “Living Library” starting inearnest in November Studying and finding the real meaning of Human Book is one of the good ways to learn a diverse perspective. The Post met a human book in Nowon Human Library’s fifth big event, held in Seoul Sangwon Elementary School’s stadium on October 19th. Q: When did you become a Human Book? A: This is my first time to become a human book. From today on, I will be in the book list of Nowon Human Library. Q: How did you decided to become a human book? A: After I retired from my job, I have decided to do volunteering such as teaching Chinese to people who want to learn it for free. I always keep in my mind that I have to share everything that I have with everyone. That is one of my dreams. Even though I am not in the work force anymore, I want to share my knowledge as many people as possible. Then, I heard about human book from people around me. I got interested and went to Nowon Human Library. I submitted an application and had an interview. After that, I became a human book and this is the first time for me to become a book. Q: What do you think about human book? A: Human book is a great idea. It is a living book! Readers can earn more knowledge than by just reading sentences. It is not only good for readers but also good for people who want to share their stories, like me. However, I think some changes should be made in the system. The meeting time is too short, which is about 50 minutes. I start talking faster because there is no time. Human books need at least one or two hours to give information and tell stories to readers. Q: What kind of book are you? A: I am a book that gives knowledge of world, economics, and China. For example, today, I told about the life of diplomat to a girl who participated in this Nowon Human Library’s fifth big event. I think I have to meet more readers to know what kind of book I am. Also, I want to become a Dongguk’s Mentor Living Library’s human book, since it seems like I really can be a mentor book of university students.